Dread Kong is a large, intimidating Kong, a member of the Evil Kings, and the boss of the first world of Donkey Kong Jungle Beat, the Banana Kingdom. Dread Kong is fought on the treetops, and must be punched multiple times to be defeated. Dread Kong later appears in the end ceremony where him and the other Evil Kings celebrate Donkey Kong's victory over the Ghastly King. Donkey Kong faces Dread Kong. The Unused trophy in Super Smash Bros. Brawl. French Rasta Kong "Rasta" is short for "Rastafarian," a Jamaican subculture which also includes dreadlocks. Dread Kong's appearance from an earlier version. The name Dread Kong is derived from the dreadlocks he has in his hair. 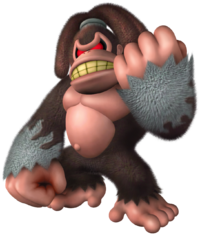 In the pre-release version of Donkey Kong Jungle Beat, a villainous, gray-furred Donkey Kong with glowing, red pupils was fought instead of Dread Kong. It could have possibly been the same character as Dread Kong. An unused trophy of Dread Kong appears in the game files for Super Smash Bros. Brawl. This page was last edited on December 9, 2018, at 16:06.